Professor Richard J. Bernstein (The New School for Social Research, New York) held a masteclass in pragmatism at the Catholic Academy in Bavaria, Munich, March 20-22, 2017. Jürgen Habermas participated in the discussion on March 21, 2017, on the topic "The Resurgence of Pragmatism". 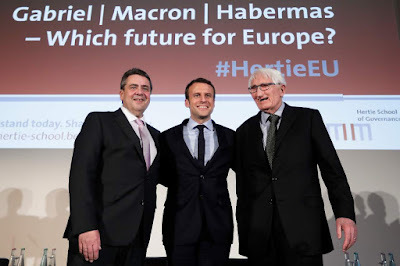 „Wir leben in einer dunklen Zeit"
Habermas on "Which future for Europe?" "Why The Necessary Cooperation Does Not Happen"
A German version here: "Europa neu denken" (Blätter für deutsche und internationale Politik, April, 2017). "European unification has remained an elite project to the present day because the political elites did not dare to involve the general public in an informed debate about alternative future scenarios. National populations will be able to recognize and decide what is in their own respective interest in the long run only when discussion of the momentous alternatives is no longer confined to academic journals – e.g. the alternatives of dismantling the euro or of returning to a currency system with restricted margins of fluctuation, or of opting for closer cooperation after all. * Europe’s geopolitical situation had already been transformed by the Syrian civil war, the Ukraine crisis, and the gradual retreat of the United States from its role as a force for maintaining global order; but now that the superpower seems to be turning its back on the previously prevailing internationalist school of thought, things have become even more unpredictable for Europe. And these questions of external security have acquired even greater relevance as a result of Trump’s pressure on NATO members to step up their military contributions. * Furthermore we will have to cope with the terrorist threat in the medium term; and Europe will have to struggle with the pressure of migration for an even longer time. Both developments clearly require Europeans to cooperate more closely. * Finally, the change of government in the United States is leading to a split in the West not only over global trade and economic policies. Nationalist, racist, anti-Islamic, and anti-Semitic tendencies that have acquired political weight with the program and style of the new US administration are combining with authoritarian developments in Russia, Turkey, Egypt, and other countries to pose an unexpected challenge for the political and cultural self-understanding of the West. Suddenly Europe finds itself thrown back upon its own resources in the role of a defensive custodian of liberal principles (providing support to a majority of the American electorate that has been pushed to the margins). "The institutionalization of closer cooperation is what first makes it possible to exert democratic influence on the spontaneous proliferation of global networks in all directions, because politics is the only medium through which we can take deliberate measures to shape the foundations of our social life. Contrary to what the Brexit slogan suggests, we will not regain control over these foundations by retreating into national fortresses. On the contrary, politics must keep pace with the globalization that it set in motion. In view of the systemic constraints of unregulated markets and the increasing functional interdependence of a more and more integrated world society, but also in view of the spectacular options we have created – for example, of a still unmastered digital communication or of new procedures for optimizing the human organism – we must expand the spaces for possible democratic will-formation, for political action, and for legal regulation beyond national borders." Discussion on "Which future for Europe?" at the The Hertie School of Governance, Berlin, on March 16, 2017. See an English translation of Jürgen Habermas's introduction here. The original German version: here. Derek Scally - "Habermas warns on EU integration without renewed German push"
"Es ist ein schöner Frühlingstag und der Philosoph kommt ins Erzählen. Er gräbt tief in seinen Erinnerungen, schärft seine Begriffe und präsentiert manche Anekdote. Karl-Otto Apel ist einer der ganz großen deutschen Nachkriegsphilosophen. Viele meinen, er sei neben Jürgen Habermas der bedeutendste. Wer der wirklich Größte und Beste ist, ist auch unter Philosophen eine heikle Frage. Und einig ist man nur darin, dass hier völlige Uneinigkeit herrscht. Fraglos hingegen ist, dass Apel der deutschen Philosophie einen Hauch von Übersee verpasst hat. Denn er war einer der ersten, welche die Wahrheit nicht mehr nur in knöchernen Begriffssystemen suchte, sondern sie in der lebendigen Sprache zu finden meinte. Für deutsche Denker ein klassischer Umsturzversuch. Sprachphilosophische Wende nannte man den neuen Ansatz – oder linguistic turn, wie es wohl als einer der ersten der US-Philosoph Richard Rorty tat. Daraus erwuchs bei Apel etwas, was unter „transzendentaler Sprachpragmatik“ Eingang in die Welt der Denker fand. „Transformation der Philosophie“ lautete der Titel seiner durchschlagenden Schrift, in der er sein Denken vorstellte. Um der Philosophie einen Sinn zu geben, musste sie erst überführt werden aus den klassischen Denksystemen in eine neue, offene Welt. Aber auch in dieser, das war und blieb Apels feste Überzeugung, gibt es einen archimedischen Punkt. Ein Letztes, hinter das wir nicht gehen können, das uns aber die Sicherheit für die Welt des Wandels und die wechselnden Werte gibt. Wir finden es, wenn wir auf die Voraussetzungen unseres Denkens und Handelns blicken. Etwa wenn einer sagt: „Du existierst nicht“ oder „Ich plädiere für Streit als Ziel der Diskurse“ geraten sie in Selbstwidersprüche, da sie den „Nicht-Existierenden“ als Existierenden ansprechen und durch das Plädoyer ja Einigkeit erstreben. Wenn es aber solche unbestreibaren Gründe gibt, lassen sich auch Prinzipien formulieren, aus denen andere Wahrheiten folgen. Das war ein echter Clou von Apel. Dieses Letzte bewahrt uns davor, dass wir offenkundigen Unsinn reden." Sie hatten ähnliche Ansätze und gingen dann doch eigene Wege: „Wir haben uns in der Tat voneinander entfernt“, erklärt Apel. Er war sich mit Habermas einig, dass das heutige Denken post-metaphysisch sein muss. Es gibt kein Zurück mehr in die Zeiten, in denen Hegel seine Systemphilosophie ausbreitete, geschweige denn in die Zeiten, in denen die Denker Gottesbeweise führten. Er entwickelte einen eigenen Ansatz. Seine Philosophie ist getragen von der Sorge um die ethische Grundlage des menschlichen Handelns. Es sollte nicht kulturellen Differenzen zum Opfer fallen, sondern universal gelten. Die ethischen Regeln werden im Diskurs festgelegt. Über Moral lässt sich reden. Menschenrechte taugen nicht zum Relativismus." 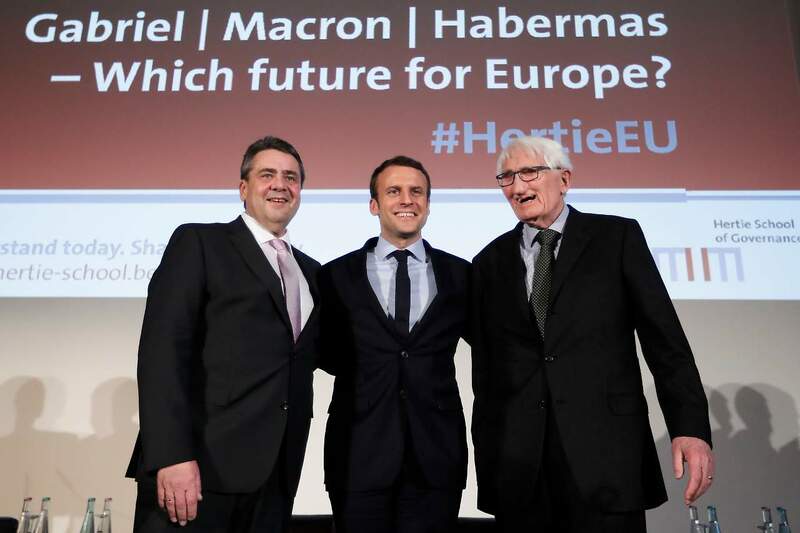 On March 16, Germany's Minister for Foreign Affairs Sigmar Gabriel, the French presidential candidate Emmanuel Macron and Jürgen Habermas will discuss the future of Europe at a meeting at the The Hertie School of Governance, Berlin.